This page is meant as a guide to assist TRAKnet users who may be receiving rejections such as 'Diagnosis Code Pointer 1 must be present' or 'ICD-9 Principal Diagnosis code must be present', or similar rejections, when using both TRAKnet 2.0 and 3.0 to build and send claims to TriZetto Provider Solutions. It is important to note firstly that while TRAKnet 2.0 and TRAKnet 3.0 share the same database diagnoses codes do not flow between the two versions seamlessly. It is for this reason practices may be receiving these rejections. These rejections, or similar rejections, are a result of creating the invoice in TRAKnet 2.0 and then sending the claim to TriZetto Provider Solutions from TRAKnet 3.0, or vice versa. Changes have been put in place to assist practices in identifying these encounters which may have been created in another version of TRAKnet in an effort to prevent rejections from TriZetto Provider Solutions. 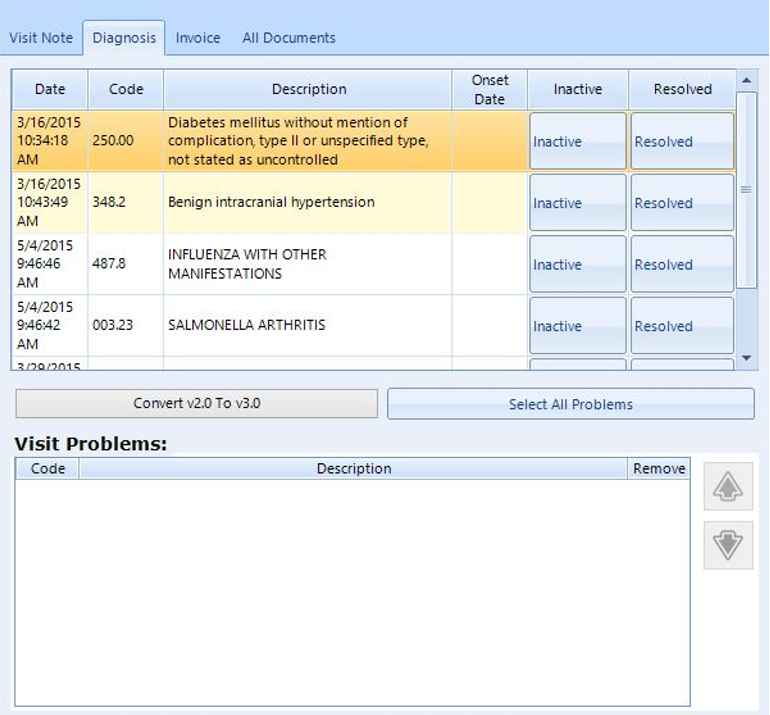 There are two new columns in TRAKnet 3.0: Version and Diagnoses. These columns are meant to help the office identify what version the encounter was created in and whether or not the diagnoses have been carried over. This column shows which version the encounter was created in: v2 for TRAKnet 2.0, which will have a yellow yield icon, and v3 for TRAKnet 3.0, which will have a green checkmark sign. None — There are no diagnoses present on the encounter at all. This will be a yellow yield icon. v2 only — There are diagnoses present, however they are in their 2.0 format and have not been carried over to 3.0. These must be converted using the below steps. This will have a red X to alert the user. v2, v3 — The diagnoses were originally added in TRAKnet 2.0 but have been coverted to 3.0. This is good and means you will be paid. This will be a yellow yield icon. v3 only — The diagnoses were added only in TRAKnet 3.0. This will have a green checkmark. The ability to convert diagnoses from encounter in v2.0 has also been added. Previously diagnoses would not carry over, causing issues with claims sent from v3.0 that were created in v2.0. To convert diagnoses click Convert on the Diagnoses tab of an encounter to convert the v2.0 diagnoses into the v3.0 format. The Convert diagnoses button will only appear on encounters where a conversion is necessary, i.e. those created in 2.0, or listed with the red v2 only mark.